1. Using the histopathological changes as a guide, estimate when the infarct and its possible extension(s) occurred. Answer: The histopathologic changes are compatible with an older myocardial infarction , though various stages are seen. The organization (fibrovascular proliferation, chronic inflammation) and fibrosis and suggestive of an infarct ranging from 2-6 weeks. 2. Explain the development of heart failure on the basis of the appearance of this infarct? Answer: The heart failure in this case is a result of a decrease in functioning myocardial cells. This has arisen from myocardial cells having become necrotic in the past and having been replaced by organizing tissue and fibrous connective tissue..
3. 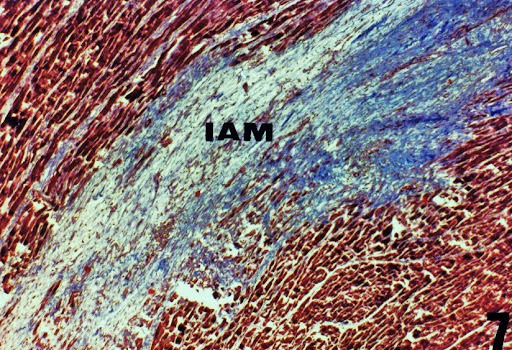 Name the yellow, granular pigment in the perinuclear zone of many of the myofibers. What is its importance? Answer: The yellow granular pigment is lipoftichsin pigment, which is the 'wear and tear' pigment seen in association with aging. It is unrelated to the myocardial infarct. 4. Would you expect the serum cardiac enzymes to be elevated? Answer: The cardiac enzymes would not be expected to be elevated unless there was superimposed acute myocardial damage (active necrosis and release of enzymes). 5. Many enlarged fiber nuclei are seen. What is their significance? Answer: In addition to the organization and fibrosis, the remaining myocardial cells show enlarged fiber nuclei. This represents myocardial hypertrophy and is a compensatory mechanism for the remaining mycocardial cells to retain a cardiac output in light of a decrease in the number of viable myocardial cells secondary to the myocardial infarction. 6. Which lesion(s) would you expect to find in at least one main coronary artery? Answer: One would expect to find significant atherosclerosis in at least one main coronary artery. As a result of the atherosclerosis, there may have been secondary thombosis. The atherosclerosis and possible superimposed thrombosis would have resulted in narrowing of the coronary artery lumen and compromise of vascular supply to the myocardium, leading to myocardial infarction. 7. Explain why the myocardial wall was thinner than normal in the area of the infarct. Answer: The myocardial wall was thinner than normal in the area of the infarct as a result of normal myocardium having been replaced by fibrous connective tissue (scar).